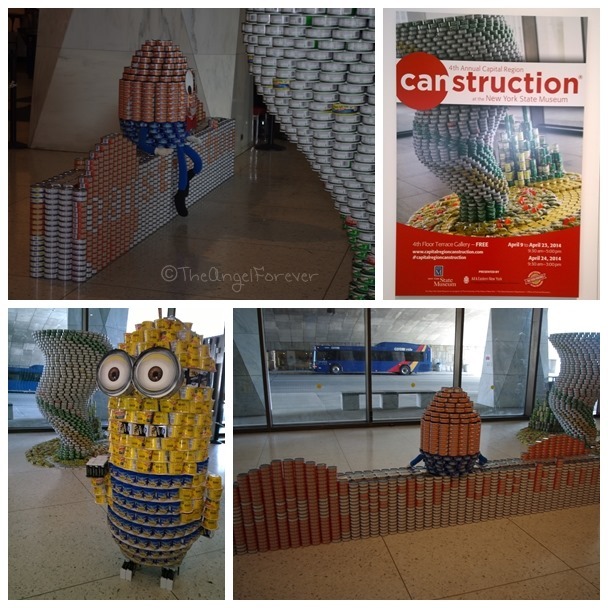 Last year, we took the boys to the Capital Region Canstruction display at the New York State Museum and they loved it. The event raises awareness of hunger in cities across the United States. The event in Albany is sponsored by companies in the area that “compete” with their structures around a theme. This year, the theme is Story Land and once the display period is over (April 24) all of the food items that made the works of art will be donated to feed people via the Food Pantries for the Capital District. Like last year, we brought cans of food with us to vote. 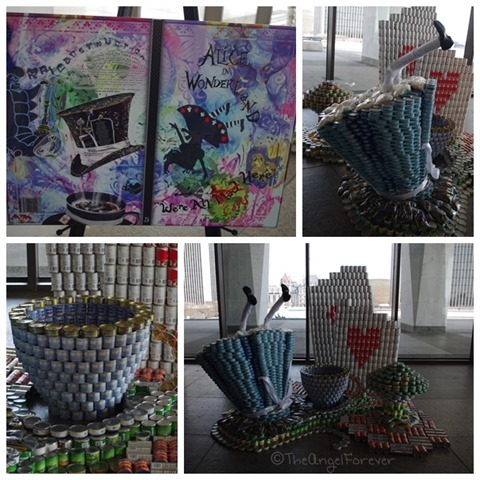 People that visit the 4th Floor Terrace Gallery will see all of the entries for this year and be able to vote with a can donation for their favorites. 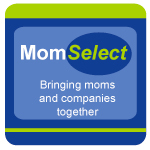 The boys take this very seriously and went around several times before they selected the one that was their favorite. Once we entered the gallery, we were greeted with two familiar Disney friends. 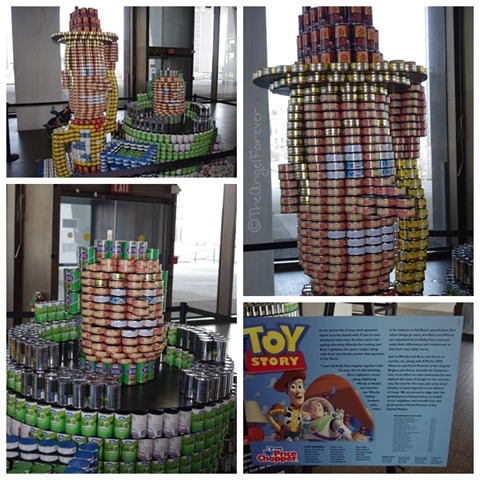 Yes, Buzz Lightyear and Woody were ready to go on an adventure in dining to help those in need. I have to say, I was in love with this one and just wanted to stay and explore more of this design. 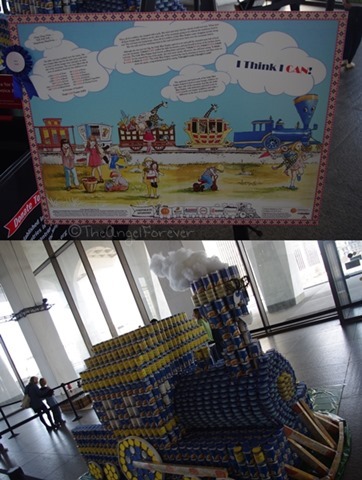 Of course, the boys caught some other canstructures and we were off to catch a train. I Think I Can really captured the spirit of this Story Land favorite. The colors in the food items really made the Little Engine that Could come alive. From here we were off for some Pure Imagination. 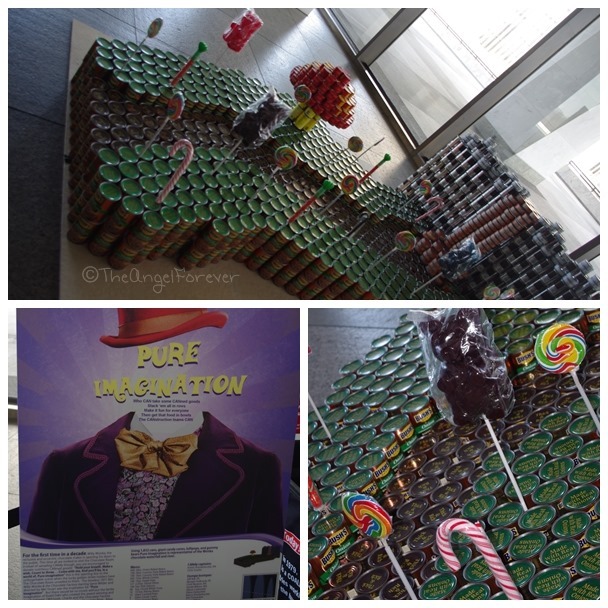 You could almost feel Willy Wonka’s presence and imagine Augustus Gloop reaching into the chocolate river of cans. Of course, we did not stay here long because Sam-I-Am was right across the way. This display of Green Eggs and Spam made the first grader in the group fall in love. He adored seeing something familiar. From here, we walked back to the other side of the Toy Story canstructure. This is where NHL and TechyDad fell head over heels (pun kind of intended) for the following creation. 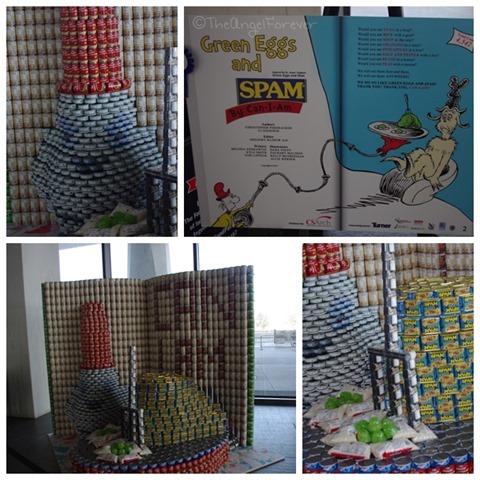 This beautiful piece of art really used a lot of items to make the three dimensions pop. I mean check out the bags of marshmallows for the petticoat on Alice’s dress. Yes, I am giving you permission to look up her skirt. Next up was another familiar Dr. Seuss character. I do believe he shall not only be hearing the Who’s, but helping the hungry. The poem of sorts on this one really stole the show for creativity and using social media in the mix. While continuing through Story Land, we bumped into more literary classics. 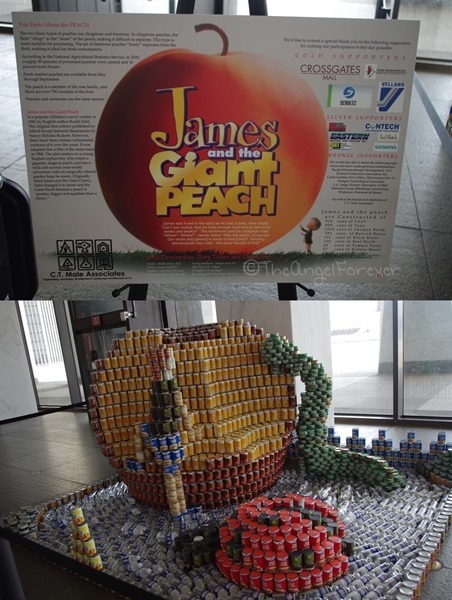 Check out how James is climbing the Giant Peach with the caterpillar. Even a picture book favorite came swimming into town to say hello. The Rainbow Fish helped us along to the last stop. I do believe you may recognize this funny little fellow with his feet stuck in a jar of honey. 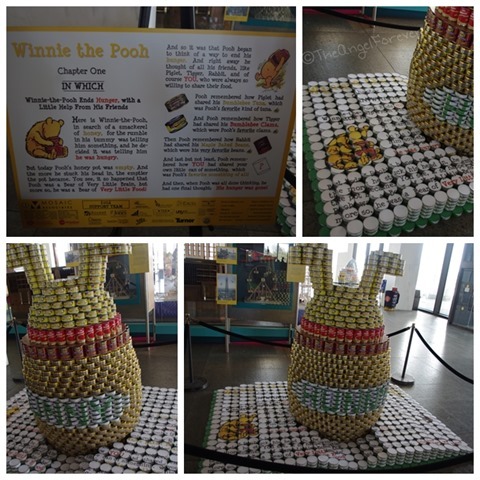 Poor Winnie the Pooh got a bit caught up here, but it was for a very good cause. 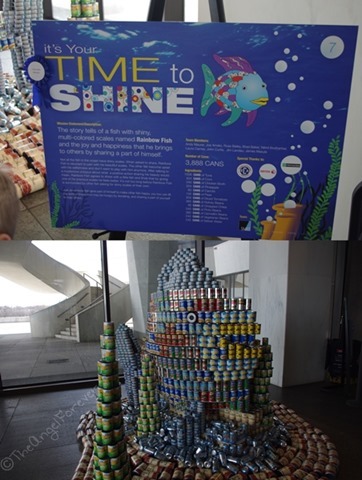 When we finished our first tour around, the boys went back to look at everything before they placed their cans into their vote for favorite canstruction design. 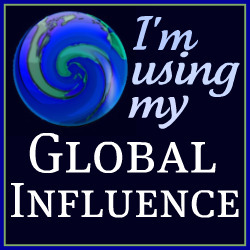 Which is your favorite from glancing at the photos? I would love to know if you have been to the Capital Region Canstruction event or one in another city. 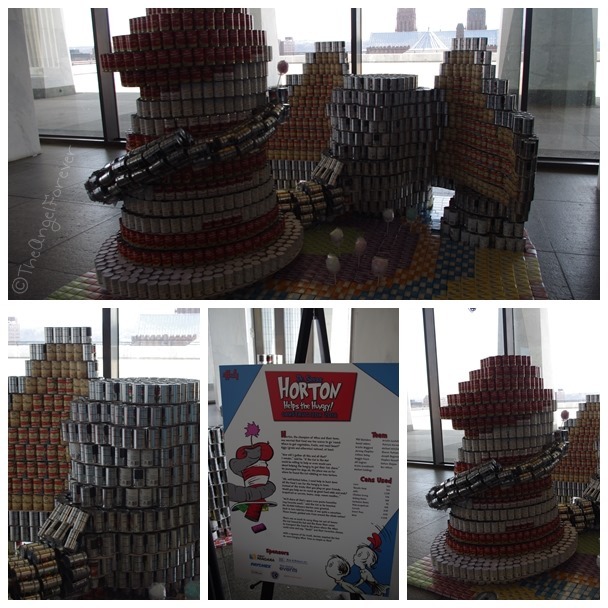 If you live in the Albany area, Capital Region Canstruction will be at the New York State Museum until April 24. Wow! That looks like a lot of fun! Those are amazing displays! I love this! And it made me a little homesick-I’m from just south of Albany! I love how they’re getting the word out about their cause.